Interiors 1900 Rochamp Ann 14in Oyster Bowed Drum Honey Pleated Band Silk Shade. 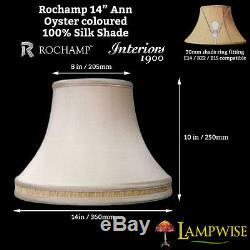 14 inch bowed drum oyster coloured shade in the finest silk. The the finest quality hand crafted traditional silk shades. Heavy duty frames with a white powder coated finish to suit most lamp bases (unless stated otherwise). 60 watts is the maximum suitable for this shade but consider low energy lamps for even more light. For example a 20W low energy CFL provides the equivalent light of a 100W conventional lamp. Return posting costs will be at your expense. Please check this listing page carefully as the answer is usually there. The item "Interiors 1900 Rochamp Ann 14in Oyster Bowed Drum Honey Pleated Band Silk Shade" is in sale since Monday, August 03, 2015. This item is in the category "Home, Furniture & DIY\Lighting\Lampshades & Lightshades". The seller is "lampwise" and is located in Milton Keynes, Buckinghamshire.